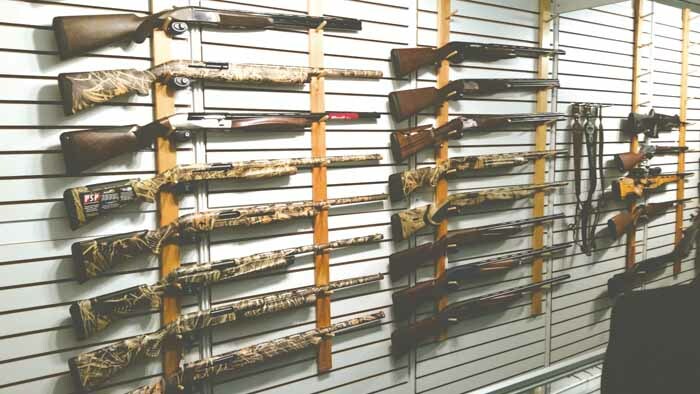 To help you trick out your outdoors experience, The Nation visited the Hunting, Fishing & Camping Show at Place Bonaventure February 19-22, where we checked out what’s new in gear, guns and gizmos. The event featured 250 exhibitors, sprawled out over 225,000 square feet of showroom, showcasing the latest trends and products, accessories, outfitters, outdoor destinations, fishing boats and ATVs. According to the Browning Company, the Auto-5 was the world’s first successful auto-loading scattergun, or shotgun. A promising new addition to this product line, Ducks Unlimited has picked it as the 2015 Gun of the Year. “It’s loaded with enough great features to make any Cree happy. Basically the Browning A5 claims to be the most reliable, fastest cycling, best performing and softest shooting recoil-operated (yes, recoil-operated) autoloader on the planet. The A5 3 1/2” version is available in barrel lengths of 26”, 28” and 30”. To reduce felt recoil, the A5 comes with an Inflex II recoil pad. Look it up and you’ll drool. The A5 feels light and swings fast,” said Nicholls. Nicholls was also drawn to the Remington Model 783 because it’s a lightweight rifle available in a number of calibres. Widely praised, the Model 783 was recently chosen as the Game & Fish/Sportsman Magazine reader’s choice in a poll of over 3000 hunters who loved its user-adjustable trigger, accuracy, compact size and general reliability. “A cool feature is the shot control as the 783 is equipped with the new CrossFire trigger system that’s user adjustable to suit your preferences. You decide whether or not you want a hair trigger or anything less,” explained Nicholls. Lightweight at only 7.2 lbs (3.27 kg) and a lightweight price at around $451 (recommended), Nicholls praised the 783 as one of his picks of the day. “While some may call this a starter rifle, many older hunters are praising it. After holding it I found it to be something I would seriously consider to be a welcome addition to any hunt,” said Nicholls. At the Vortex table we met Alain Guinette who was offering various pairs of binoculars. His favourite was the new Crossfire, which came in the 10×50, 12×50, 8×42 and 10×42 configurations. 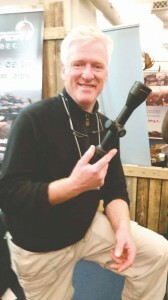 “This is a great pair of binoculars because it is in the $200 range and for that price you get great quality, bright images, a nice focus knob and this is all backed up by a no-fault warranty,” explained Guinette. 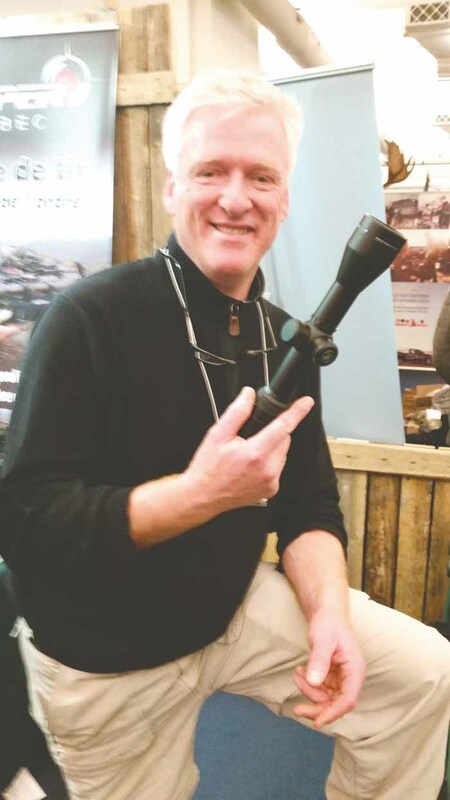 Beside Guinette’s table was Mario Dutil from Viper Riflescopes, who was eager to show us the 2.5 -10.44 Deadhold DDCMOA model. “It’s great because it’s not expensive. It is very lightweight, very accurate and very clear. It works particularly well in very cold conditions because of the nitrogen inside of the scope,” said Dutil. Next we met Pierre Lagace from Agence Denis Gendron, who was showing the luxurious products that Zeiss had on display. While Zeiss products might be synonymous with the ultimate in quality and the price tag reflects that, Lagace said there is a range of products for every budget. “Zeiss is a German brand of riflescopes and German is synonymous with superior quality. Zeiss is world renowned for its lenses as they do a lot of research and development in this area,” said Lagace. While a top-of-the-line Zeiss riflescope may cost around $3,500, they also have a range of excellent quality scopes that start around $525. According to Lagace, this would be a solid investment in a product that will likely last a lifetime. At the Rampart International display, which mainly carries tactical equipment that could be used for hunting, Nicholls’ eye was caught by the CamelBak – ThermoBak 2L, a hydration backpack that is perfect for a long, hot day out on the land. According to Rampart’s Kyle Sorrie, these camo backpacks have been around forever and they are the brand name when it comes to hydration units. “What’s great about the military grade is that you have something that’s strong and will last a lot longer. It’s also anti-micro bacterial and the textiles are stronger too. Instead of normal nylon, reinforced materials are used so it will last longer and not rip. 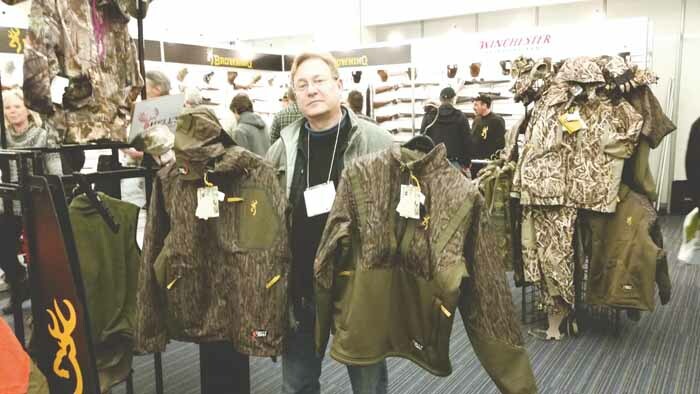 For a hunting application, it comes in coyote brown and multi-cam so it’s not like you are wearing a bright blue bag while on a hunt,” said Sorrie. 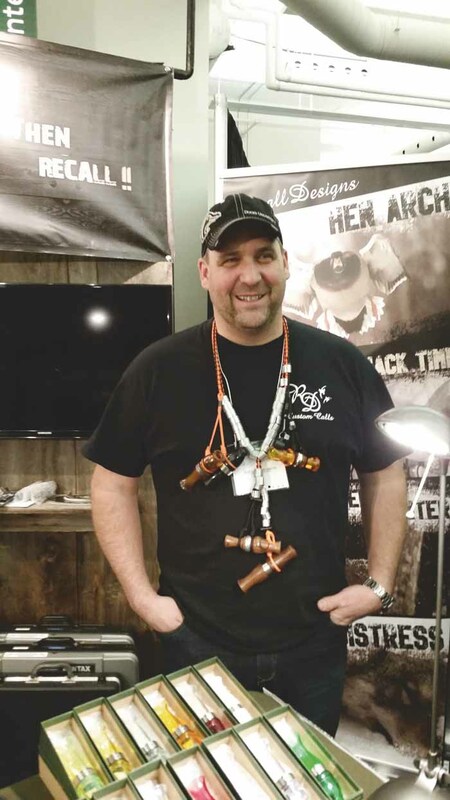 The smiling face of Rheal Charlebois from Recall Designs is always a sight for sore eyes as he and his incredible rainbow of calls is just so much fun to peruse. “The show is just gearing up for me; I am showcasing my products and giving out information on them. This year, I have a new kind of turkey call and I also have my new Short Fuse line which are very popular,” said Charlebois. Bright and compact, the new Short Fuse model is a sweet and sturdy little call that packs a big loud call that could certainly be heard throughout the show room. One of the funnier things about attending the show with Nicholls is that the lower part of the showroom is a constant cacophony of fowl and game calls and other sounds. The Nation boss always feels compelled to answer them in his exuberance for the event and thrill of an upcoming hunt. However, he is not the only one. The huge room echoes with the sounds of ducks, geese, turkeys and other less identifiable species and excited hunters letting out their calls to show off their vocals to their likeminded show-goers. Along with the firearms, hunting clothes, the latest in fishing technology from scanners to reels and outfitting camps from every corner of Quebec, there are those who come to the event annually to hawk vacations geared at those who might opt for a more exotic kind of fishing in the deep sea. Every year the Nation runs into Mackie, a flashily dressed representative from the Cape May, New Jersey, who represents various New Jersey tourism offices while walking on stilts. For those looking to improve their rustic hunting camps, David Gouvard from Énergie Solaire, a Laval-based solar panel company, offered an alternative power source. “We have solar panels and a wide variety of products from the US, Germany and China that can suit the needs of all sorts of clientele,” said Gouvard. “These are just great for your bush cabin because just a small kit can get your small items like your lights, TVs and phones running. Lots of hunters invest in these kinds of things. Among our favorite finds of the day was Happy Yak products, a vendor and creator of delicious dehydrated meals that can be efficiently tucked away into a backpack as a life saver when a hunt or a fishing trip does not go to plan. Featuring soups, stews and all kinds of exotic meals that just need to be rehydrated, according to Natasha, who was manning the table, these meals are created through “lyophilisation” – more commonly known as freeze-drying. What’s great about these meals is that you end up with food that springs back to its original splendour when prepared – vitamin rich and delicious. All of the meals are prepared with meat, legumes and soy protein so that you are getting something healthy that will keep you going for hours. Sold at various sport and adventure stores in Quebec, you can also order them online. Another sight that always delights us at this show is the folk from Mistissini Tourism to promote the natural virtues of Lake Mistissini. At the booth this year was David Mianscum, who was busy chatting with some excited fishermen. 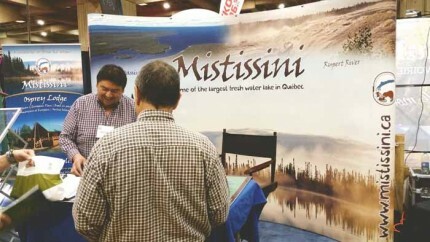 “A lot of people drop by to find out about Lake Mistissini. This time we are selling them on the fishing camps, we have two in the area – Osprey and Camp Louis Joliette,” he said between pitches to potential clients. Our attention was caught by the NaïtUp Roof Top Tent, which looks like something that could be a real lifesaver while traveling. NaïtUp claims the pop-up tent can be installed on the rooftop of all vehicles with the use of just two roof bars and in 30 seconds flat. What is interesting about this product was how sturdy it looked while offering the opportunity for a tent with a panoramic view, and a night’s sleep devoid of soil moisture, animals or pests and danger. Emerging from the show, Nicholls was both satisfied and elated. The look in his eye revealed it all – he is now ready to jump at any chance to get out into the bush and onto the water. This is what visiting this show does to its patrons – anticipate all of the good that is to come.